Collection and removal of debris is of high importance to any cleaning regime. 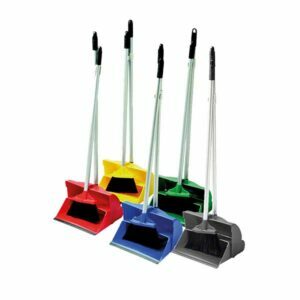 Our range of quality dust pan and brush sets are just the tool for the job. Available in either soft or stiff bristles makes tidying up a breeze. 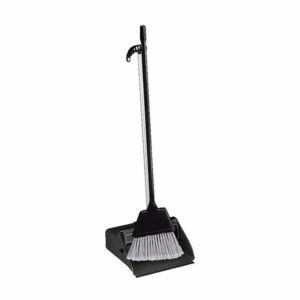 B-Fly is the dust pan with rubber edge and squeegee system. This allows you to lift semi-liquid substances or damp material without leaving traces on the floor. With its light ergonomic structure, the B-Fly is ideal in places where food and semi-humid substances are dropped frequently, such as in bars, restaurants, canteens, hospitals. They can be picked up simply and quickly, allowing the residue to be disposed quickly and also safely. 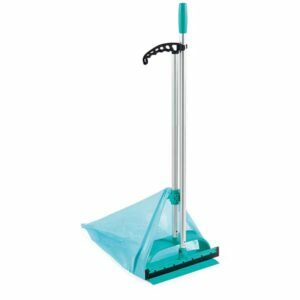 The B-Fly has a particular shape which makes it easy to clean however efficient in picking up waste because it adapts perfectly to the floor, in this way the squeegee with the rubber blade can easily convey the residue into the bag. It is sufficient to detach the bag to eliminate the dirt, thus avoiding contact with your hands and unpleasant odours. The dust pan & brush set feature a bonded rubber strip to ensure all dirt is picked up first time. A serrated edge is present to easily remove any soiling from the hand brush.The hand brush is complete with soft black bristles ideal for clearing fine particles from floors and also surfaces. 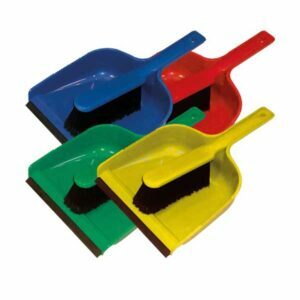 Both the dustpan and brush are available in the four hygiene colours. The dust pan & brush set feature a bonded rubber strip to ensure all dirt is picked up first time. A serrated edge is present to easily remove any soiling from the hand brush.The hand brush is complete with stiff black bristles. 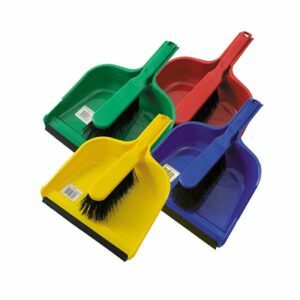 Both the dustpan and brush are available in the four hygiene colours. 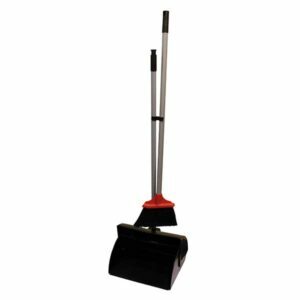 Heavy duty Long handle dust pan & brush set removes the need to bend down when sweeping or collecting waste. Features a bonded rubber strip to aid collection of debris. Broom handle is complete with an ergonomic handle grip. Long handled dust pan & brush set removes the need to bend down as well as preventing obstructions and also unnecessary back strain. Features cover to prevent contents falling out. Broom handle is complete with a bracket to keep attached to the dustpan to ensure it doesn't fall over. Reducing a trip hazard and allowing safe, tidy storage.